Exercising may help more than your biceps, triceps and other muscles; it may help your eyes as well. A 15-year cumulative study recently published in the British Journal of Ophthalmology showed physical activity had a positive effect on age-related macular degeneration (AMD), an eye condition associated with aging. AMD gradually deteriorates the ability to see objects clearly when performing common daily tasks such as reading and driving. Between 1988 and 1990, 4,926 individuals were given a baseline eye examination. The patients were then retested every five years. They were also questioned about their daily physical activity with questions such as: On average, how many city blocks do you walk each day? The study included men and women between the ages of 43 and 86. According to the study results, the incidence of AMD dropped up to 70 percent in individuals who led a more active lifestyle. Other factors, such as diet, were also taken into consideration. 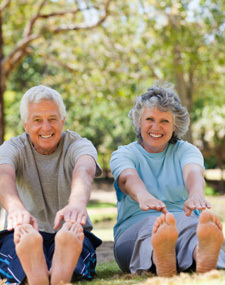 To learn more about how to keep active in your golden years, talk to your chiropractor! Source: Knudtson M, Klein R, Klein B. Physical activity and the 15-year cumulative incidence of age-related macular degeneration: The Beaver Dam eye study. British Journal of Ophthalmology, October 2006;90 (10):1461-1463.